Canary Wharf in London’s Docklands. Panasonic Lumix GM1 with 12-32mm lens. Post processing in Nik SIlver Efex Pro and Nik Analog Efex. I would like to publish a note of thanks to the security officers at Canary Wharf in London. Yesterday I visited London with a couple of friends as tourists to take pictures. 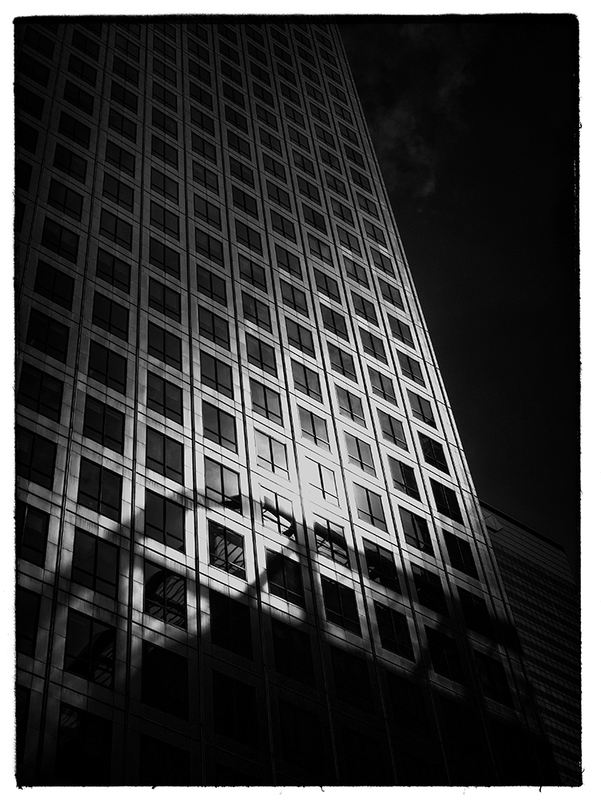 One of our locations was Docklands with the intention of photographing some of the icon architecture including Canary Wharf. Waiting for our friend outside the Tube Station we were taking some pictures of the buildings when we were approached by a security officer to ask if we had permission. What was nice about this is that the officer took the trouble to look at the pictures we were shooting and then contacted security to allow us to continue. It’s great when officials recognise that not everyone with a camera is a terrorist or pervert and treat people with respect. If you were ‘outside the station’, why did you need ‘permission’? I’m not suggesting that you should have gone into confrontation mode immediately, but seeking a clearer understanding of what is and isn’t ‘private property’ in the docklands area. Glad to see you using your new GM1 – and looking forward to reading more of your experiences with this camera. You will be hearing a lot more of the GM1 shortly. This was my first outing and I really like the camera. I’m quite surprised at just how good it is. The entire areas is owned by Canary Wharf estates. We did check. Had we been on public property there wouldn’t have been a problem. There are a lot of these types of private/public spaces these days. Manchester media city is another but the BBC take a very dim view of anyone with a camera taking a picture. I think that the security did a great job in your experience. In cities more and more the lines are blurring between public and private. Also there are many misconceptions about taking pictures and what you can and can’t photograph. Really nice shot. I agree. Unlike one security official at Carillion (yes I will name them) who tried to stop me taking a picture of a road from a bridge. I took it anyway but it was the whole manner that puts you off and you lose your rhythm. This guy was very different and willing to talk to us. The point is, it wasn’t a public road. It was a paved area which pedestrians have the right to use but is private property. It’s also the financial centre of London so security needs to be high. I can see both sides of the argument which is why I am so happy.